Scouring the world for resources is an important part of Assassin’s Creed Odyssey. Vital resources are used not only to upgrade your ship and add engravings to your weaponry and armour, but craft your ranged ammo as well. Here are a few tips to help you stock up on Olive Wood, Iron, Leather, Obsidian Glass and Precious Gems. You can loot most common resources while you’re wandering around from place to place. Olive wood can be gathered from thin trees that glint as you see them. Leather you get from killing animals. While Iron, Obsidian Glass and Precious Gems are found in glistening rocks in the undergrowth and in caves. Roaming around specifically trying to find resources like this is time consuming, not to mention boring, so here are a few more interesting ways we’ve found to get what you need. Interestingly, Olive Wood is probably the most valuable resource in the whole game, since you need it in large amounts to upgrade your ship, the Adrestia. It’s no use scouring the continent for the best Special Lieutenants in Assassin’s Creed Odyssey if you just get sunk straight away, so you’re going to need to get your hands on a lot of wood. The first way to get more quickly might seem obvious: just buy it from blacksmiths. 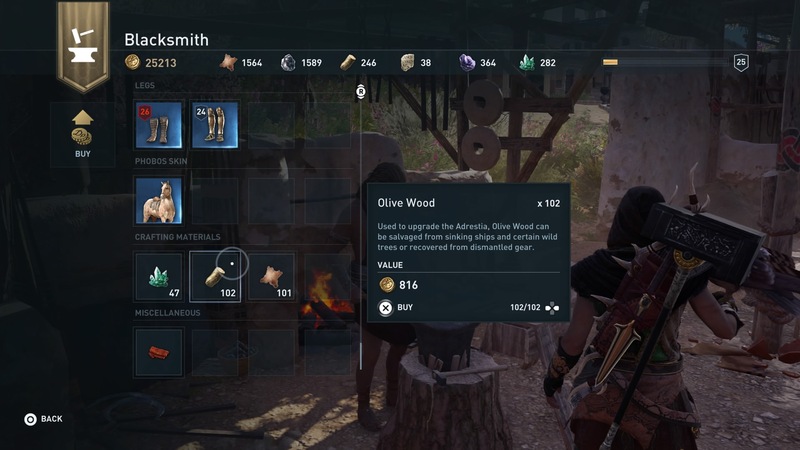 Shop vendors in games are usually useless, but in Assassin’s Creed Odyssey, they’re actually pretty good. They won’t always stock some, but a lot of blacksmiths will have up to 100 Olive Wood in their inventory for around 8-10 Drachmae per unit. You get quite a lot of money throughout the game, so it’s a worthy investment. Another method is sail around the Aegean and sink as many enemy boats as possible. Doing so will net you a significant amount of resources of all kinds. You seem to get an especially large amount of Olive Wood for cleaving ships – ramming through their centre once their sails have been destroyed. This is more time consuming than buying it, but more interactive than wandering around aimlessly looking for some. Finally, another good strategy is to raid Nation Chests and War Supply chests in military camps. These tend to stock a large amount of resources inside, so are worth you time to search out. Obsidian Glass and Precious Gems are vital to upgrading your equipment in Assassin’s Creed Odyssey, it’s no use having the best weapons in the game if they’re stranded 10 levels too low for you to use. By the same token, engraving one of the best armor pieces in Assassin’s Creed Odyssey with a top-tier ability can make a big difference to your fortunes in battle. The same methods as Olive Wood also work for Obsidian Glass and Precious Gems, however, you also come across large amounts of these resources through more violent means. Nation Leaders, Fort Polemarchs, and military Captains tend to drop a decent amount of Obsidian Glass when you take them out, so prioritise them if you’re running low. You can find Polemarchs in locations that are marked with large red icons, and leaders are usually seen in the largest settlement of a region. Looking for the best weapons and armour or where to find the best crew mates? Check out our ultimate guide for all things Assassin’s Creed Odyssey.